Give your little man an action-packed birthday he’ll be guaranteed to love. You’ll find all types of boy themed entertainment options listed below. Kids that are obsessed with their favorite team can have a sports party, while gamer guys will rejoice when the see a video game trailer front of their house. Whatever your son is into, we’ve found the best parties that are just for boys in New Jersey. Is your son a super athlete? Scroll below to see tips on how to have an all-star party. If your little boy loves sports, why not have an “all-star” themed party that you can pretty much guarantee that they’ll love. Here’s what you’ll need for planning and hosting a birthday party for your little athlete. 1. Invitations: Receiving the invitation is where the party starts. Themed invitations that incorporate your child’s favorite team or sport will set the tone for your party before your guests even walk in the door. 2. Food: There’s no reason why food can’t be part of the themed festivities. What’s a sprots themed party without a tailgate complete with hotdogs, soda and chips? Visit the local bakery or supermarket and purchase a cake shaped like a soccer ball, basketball or football. 3. Entertainment: Organize activities based on your child’s favorite game. This works best for families that have large backyards or live near a public park. If your guests can’t get enough of football, have stations set up that will test their throwing, catching and punting skills. 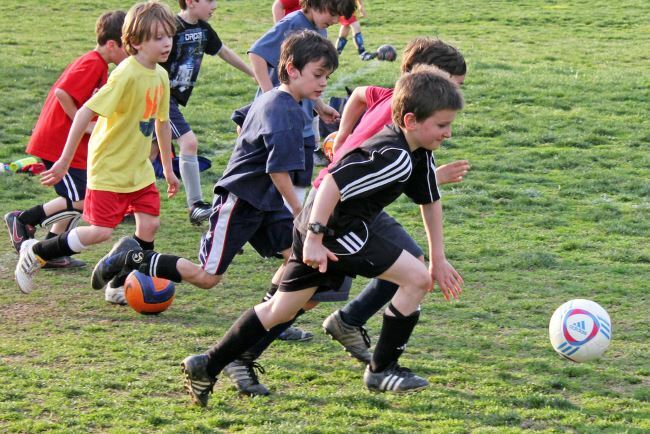 If you’ve invited a lot of guests, organize a scrimmage for a mini soccer game. To make things easier for yourself, consider hosting the birthday at a sports center or athletic complex. Your guests will be able to use the fields, courts and equipment. An added bonus is that these types of venues typically have coaches or attendants on hand to supervise the parties. Are you ready for your child's next birthday? KidsParties.Party features many venues in New Jersey that offer these types of services, as well as over 50 categories of other children's birthday entertainment! No matter what capture's your child's interest, KidsParties.Party can help you find everything you need for your child's big day. You can even find tips and advice for your party on our handy blog! Do you want a birthday wish written just for your little athlete? We know every child is different, and so we wrote hundreds of birthday card messages for every one of them. Check out our lists for boys, girls, and all the rest to find one that fits your child's lovable personality the most! We want you listed! Fill out this form to get started today.